An unloaded gun is about as dangerous as an unloaded washing machine, although using the former to bludgeon someone is a lot easier. In that sense, I don’t fully understand the outrage over Gilbert Arenas bringing empty firearms into the Washington Wizards locker room. He could’ve fired all the imaginary shots he wanted and not hurt anyone. In fact, if you’re going to bring ANY gun into the workplace, for goodness sake, let it be empty! But considering all the damage caused by guns and the divisiveness over our Second Amendment right to bear them, it’s little wonder that Arenas has folks (pardon the pun) up in arms. Between the Rev. Al Sharpton, NBA commissioner David Stern, the Brady Campaign, federal prosecutors and a media horde, it feels as if more people are, er, gunning for Arenas than hunting for Osama. One can only imagine the fury if Arenas’ guns were loaded. Yes, it was a knucklehead move. Yes, the NBA has strict prohibitions against bringing weapons into its buildings. And, yes, Arenas ran afoul of gun laws in Washington, D.C., among the nation’s strictest. He has paid for that dearly—an indefinite suspension without pay ($147,208-per-game) effective Wednesday—with further consequences possible, such as years in jail and the voiding of $111 million left on his contract. He has to accept responsibility for his actions, with no one to blame but himself. But the general (over) reaction? That’s a result of way more than him. It’s a sad byproduct of our violence-addicted culture, racial stereotypes, hyperactive news cycle, struggling schools, teeming prisons, coddled athletes, misrepresenting rappers, unrepentant film producers, unaccountable politicians and incompetent social leaders. To be fair, reports have varied on the extent of the incident. 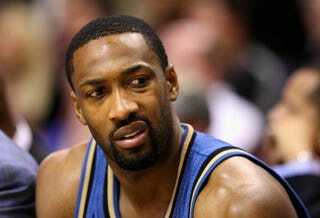 Early accounts suggested that Arenas and/or teammate Javaris Crittenton “drew” unloaded guns on Dec. 21 during a dispute in the locker room. The notion of NBA players aiming guns at each other was too much for Sharpton, who urged Stern to come down hard, fearing that the players’ color would make it a lesser issue. Arenas called the incident “a misguided effort to play a joke on a teammate.” According to the Washington Post, Crittenton became upset and flung one gun across the room, claiming that he had his own gun. This is where I disagree with Sharpton’s claim that the uproar would be greater if a white player pointed an unloaded gun at a black player. I suspect Sharpton’s reaction would be louder in that scenario. But I think the overall response (especially in the mainstream media) would be treating the incident like a joke, misguided as it might be. And if it involved two WHITE players, half of us might’ve never heard the story. However, considering the rampant depiction of thuggish (black) athletes and thuggish (black) young men virtually everywhere you turn, adding guns to an NBA locker room was bound to be explosive. Either way you look at it, that’s not funny. But an empty gun isn’t deadly, either. Deron Snyder is an award-winning journalist and freelance writer based in Upper Marlboro, Md.